I went to see The Amazing Spider-Man a few days ago. I think the reboot works overall, though in some ways, it still seems a little soon for it. 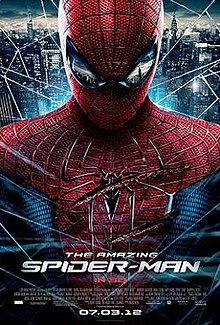 The plot is interesting and entertaining, though it does cover some of the same ground as the first Raimi Spider-Man, showing how Peter gets bitten by a spider and gets new abilities. He has to deal with the Lizard instead of the Green Goblin and his love interest is Gwen Stacy instead of Mary Jane. I don't know much about those characters and it was a little weird for Mary Jane to not be in the movie. I do like Gwen, and in some ways, she seems like a stronger character. It's just different. A little more background about Peter's parents is shared. I don't remember learning anything about them before this. I like that there is a bit more about them. There is still a lot of mystery surrounding them and I'm thinking more will come out in future movies. The Lizard is an interesting, and even somewhat sympathetic villain, though still, in some way, less impressive than Doc Ock or Green Goblin. Aunt May is a little younger and bit more feisty..and there is some tension between her and Peter. Uncle Ben still talks to Peter about responsibility, though in a different way. The action is fine. The movie isn't too violent, though Peter ends up battered, bloody, and bruised more than once. That is probably more realistic since his spandex outfit doesn't offer much in the way of protection. I did see the movie in 3D. It was fine. The movie is more serious overall I think. There are a few little things that add humor, but Peter didn't make as many wisecracks as he did in the other movies..or like he does in the comic books. The characters and actors do well with their parts, though Garfield does seem a tad old for the age of Peter in the movie. This time, he remains in high school through the whole movie. Gwen and Peter start a relationship, though really, not much is shown. They hardly speak at school, and then they are making out and Peter is telling her he's Spider-Man. She isn't the only one who finds that out either. I know in the comics, Peter went public at Spider-Man in that whole registration storyline, but it is too soon in the story for these movies for people to know. It just doesn't seem right. It even seems to be hinted that Aunt May figures out that he's Spider-Man. It isn't said for sure, but from how things are presented, it certainly seems like she figures it out. Peter and Gwen's relationship is fine, though it doesn't get as developed. There is just a little something missing from that part of the story. I did like the movie overall, though there are a few issues with it. The movie is worth seeing. Some things are being set up for the next movie. I have a few ideas already of what might be coming. Thanks for the review...I haven't decided yet if I'll go see it. I will probably see The Dark Knight Rises and have already seen The Avengers so 3 super-hero movies in one summer may be a bit much. For the record, I think Gwen Stacy showed up in the comics before Mary Jane did. For the record, I think Gwen Stacy showed up in the comics before Mary Jane did. Yes. I haven't read any of the Spider-Man comic myself, but this is what I have read so far. Mary Jane was there before Gwen in the Ultimate Spider-Man storyline though, on which the Sam Raimi Spider-Man is mostly based on. I've learned that Gwen was around first and Peter's high school love in at least some of the comics. Everything else I've seen - mostly the cartoons I saw growing up - had Peter with Mary Jane, so that is really all I've known since I haven't read the comics. That makes it a little odd for me..not bad..just odd. I plan to see The Dark Knight Rises too..and I saw The Avengers. So far, I think Avengers is better. Dark Knight Rises is going to be different ...darker and more serious, but I'll still see it. Speaking of super-heroes, today I ordered a couple Supergirl books through Amazon from a seller named Dragonfire...is that you? No. I haven't sold anything through Amazon..or ebay. I hope you like the books you got. I have seen the latest trailer or The Dark Night Rises today (not necessarily a new one). They are sure selling this film in a weird way. It opens with several action shots, mixed with people, yet no actual sound and very slow emotional music. Well, making it yet again different would be a good approach, I guess. It opens with several action shots, mixed with people, yet no actual sound and very slow emotional music. I just saw a new tv ad for The Dark Knight...and there have been 1 or 2 other new ones in the last week. Just came back from Spidey. It was OK, but I still like the old first one better. Some fans complained about the old first movie that the way the story was told Spideys powers were reproducible. Well if not back then, then certainly now, because they didn't have just one freak spider but hundreds. The lizzard was OK, too. But I did not like that they rehashed the same idea as with Green Goblin, i.e. him hearing his own voice. Gwen's fathers wish. I mean Spidey promised a dying man to stay away from Gwen to keep her safe. Naturally that is a promise hard to keep. But have him actually say that he doesn't intent to repect that wish?! I don't remember hearing that people complained about his powers being reproducible in the first movie. I do remember people being ticked off because of the web shooters being organic instead of something Peter designed himself. I didn't even think about the fact that someone else could get bitten because of all those other spiders there. I read something around when I saw the movie that claims the movie makes it clear that Peter's father had been experimenting on Peter before he vanished...did some sort of genetic something or other to him. Whoever came up with that idea says that is why Peter could control the changes and didn't go mad like Dr. Conners. I honestly don't remember seeing anything in the movie that indicated that his dad experimented on him. Peter and Connors were exposed...infected...whatever to different species. And Peter's dad was involved in the creation of the spiders to begin with... With what happened with the lizard, Peter gave Connors the one equation he found in the notes, but that doesn't necessarily mean that is the one that his dad used with the spiders. Maybe he refined it more and Peter didn't find the other equation...or his dad didn't write it down because of who ever was after him. I see Norman Osborn in that...especially when that one guy was pushing Connors to move forward with human testing. He refereed to Peter's dad and what happened..but that's just my theory for now. I did think about that with Lizard sort of cracking up and hearing his own voice like Norman did. I just forgot to mention it in my review. You would think they could come up with something at least a little different to show that Connors wasn't in control of what was happening. Did you see the extra scene in the credits?